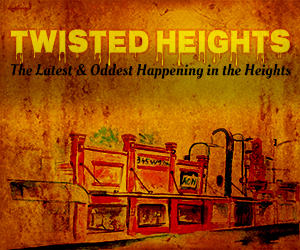 Buyers’ or Sellers’ Market in Heights? See Stats. Two years ago I wrote about this topic. What Price to Offer on a Heights House? A year or so ago the Heights housing market was crazy: Multiple offers, short time on market, little inventory. It was definitely a sellers’ market. See an article I wrote about it back then: What Price to Offer on a Heights House? It is different today, but what is it now? 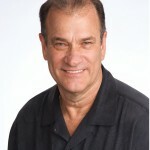 A buyers’ market or a seller’s market? Real estate is local. 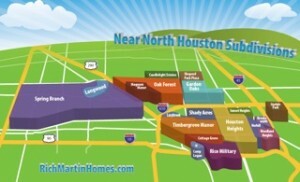 It’s good to know about national, Texas and Houston market, but what I care about is the Heights market; the Heights and surrounding close-in neighborhoods. That is where I live and where I help people buy and sell. : this value indicates how quickly homes sell. 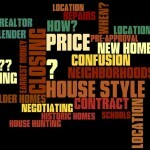 It is the days it takes for a property to go under contract. 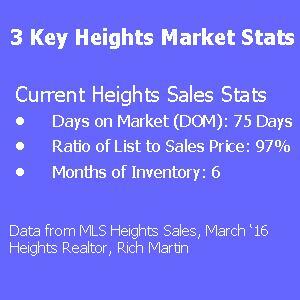 Currently the average DOM is 75 days for Heights resale homes. It was 36 days at the beginning of 2015. Definitely a slow down. Historically (before the buying frenzy of the last couple of years) days on market has been 90 days. So, we are back to a “normal” market. Note: I excluded new homes from the stats. They are often listed before construction begins so they could be on the market 6 months before they are completed. Currently this ratio is 97%. This means that the “average” home sells for 97% of list price. Last year this number was 98%. Historically we were at 97%. So, again it appears we have returned to normal. Months of inventory is the time it would take to sell the existing inventory of homes. 5-7 months inventory is the average range: below this it is a seller’s market (Buyers need to jump on a home fast if they want it). Above this range is a Buyer’s Market; more homes on the market gives a buyer more homes to chose from and thus typically more time to browse. At this point in time there are about 300 homes on the market in the Heights. They are selling at about 50/month. This means ~6 months inventory. This is a neutral market. 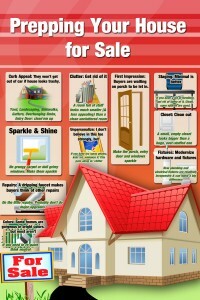 Caveat: All of these terms are averages, but they don’t mean much when it comes to a specific home. The average DOM (days on market) is 75 days, but ~20% sold in 10 days. So if your ideal home comes on the market, don’t assume it is going to be around for a couple of months…buy it! The average house sold for 97% of its list price, but ~20% of these sold for list price or even a little above. So, don’t expect a bargain. Inventory of Heights homes is in neutral range, but…this is price dependent. The last time I looked, the inventory of million dollar homes was about 10 months! Definitely not a good sign for all those new $1M+ homes on the market. A buyer definitely has more bargaining power there. Conclusions: Forget all the headlines about market conditions. Pay attention to your neighborhood. Whether you are buying or selling a home ask your Realtor about these 3 stats in the neighborhood you are interested in and the price range you are interested in.